Posted April 2nd, 2019 by Guild & filed under News. Members will receive a full set of meeting minutes soon. In the meantime Christopher Eyte reports on some key points from this year’s AGM. 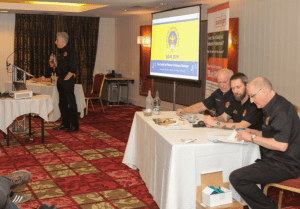 EXCITEMENT about the future of the Guild of Master Chimney Sweeps was clearly evident with a definite buzz in the room as members took their seats for the 2019 annual general meeting, held on the final day of the Guild’s trade exhibition. About 100 members were in attendance as Lawson Wight, Guild chairman, led on an overall presentation. There followed a comprehensive summary of the important points of Guild business over the last year, current projects / issues and future plans and challenges. He started by showing a photo of the AGM in 2006 – just nine people attended the meeting at the time. The growth of the Guild since then has been tremendous and it’s a testament to the hard work of many people over many years, who do a lot behind the scenes on behalf of their fellow sweeps. The treasurer’s report went over how funds were constantly being reinvested into the Guild for its members’ benefit. Of course, the Guild is a not-for-profit organisation with a democratically elected board. Guild members then heard that 58 people attended the main Guild training course last year. Just over half of them (55%) were new and 45 per cent were already working in the chimney sweeping industry. 26 members left for various reasons. Lawson pointed out “good training is at the heart of any industry” and noted how generally the Guild’s reputation for the standard of training continues to be top drawer. John Stone, Guild director for Scotland, was praised for ‘doing an excellent job’ on the training front, developing the Guild presence and resources in Scotland. The future in Scotland for training and support via the Guild’s resources looks very exciting indeed. The first Guild 5-year refresher course has been piloted and the feedback has been very good. Plans are afoot for a new service and maintenance course and mentoring remains a key component of the Guild approach. The CCTV / Integrity testing course and the Historic and Thatched property sweeping course continue to give excellent value for members wishing to expand their professional development. Youngest Guild sweep Charlie Ross, sweeping chimneys in Edinburgh and Fife for Firework Chimney Sweeps, was given a mention. As previously reported in News for Sweeps, he drove himself to the Surefire Centre in Ripley at the beginning of October and passed the standard assessments – aged just 17 at the time! It was explained that the former Find a Chimney Sweep has been replaced with a new site. The top viewed location in the directory was London with tied-in-second Bristol and Manchester. Mobile phones were now the top devices used for viewings. Facebook followers for the Find a Chimney Sweep consumer page continued to grow well. The best post was ‘The Old Tyre Trick’ video, which reached with 44,000 views of the video. The Find a Chimney Sweep website will receive even more support in the time ahead to make it work better for Guild members businesses. David Sudworth gave an update on the BurnRight campaign, which celebrated its first anniversary at the AGM. He said that 12 months on, a professional and identifiable brand had been created and thousands of consumers have been educated. The website for BurnRight is continuously evolving and supporters of the campaign include sweeps, solid fuel professionals and fuel merchants right across the UK. BurnRight has also united some of the best known chimney sweep associations and won the support of Defra. David has also had meetings about the campaign with the Welsh Climate Change, Environment and Rural Affairs Committee. 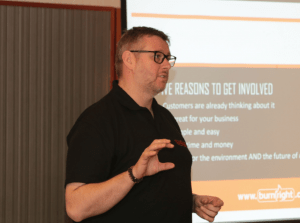 An example of chimney sweeping trade associations working well together was Lawson Wight’s recent visit to an APICS meeting in Exeter to explain BurnRight, where he was warmly welcomed. The visit by four association leaders to Defra last July was a first in the industry. Lawson thanked David Sudworth for his hard work with the BurnRight campaign, which earnt a round of applause at the AGM. GDPR rules came into effect in June 2018 and John Stone was lauded for his hard work on data protection, which is a policy that Guild members can use for their own businesses. Thomas Wiggins was then thanked for his work in creating a two-appliance certificate, saving members a little more time and money. 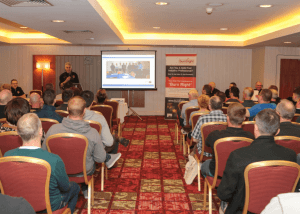 Steven Howard, technical director, and David Wooffindin, training director, attended a presentation on the chimney sweeping NVQ last June (2018) and that started a dialogue which resulted in the NVQ leaders, Phil Cleaver and Chris Geeves, leading a seminar at the trade show. Steven also held a fruitful meeting in Oxford with Dennis Milligan of the Stove Industry Alliance. Changes were published in October for the British Standards BS 8303:2018. This is in regards to changes of basic requirements in domestic heating appliances of up to 50KW. Sascha Meding, Vice Chairman of the Guild, then gave a presentation on his relational work on behalf of the Guild, and the UK chimney sweeping industry generally, on an international level. 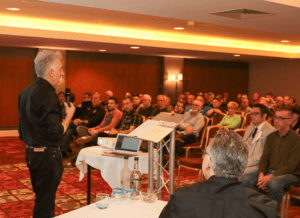 The Guild represents the UK sweeping industry at the European Federation of Chimney Sweeps (ESCHFOE) and Sascha has been appointed the treasurer of the federation. Sascha recounted his visit to the European Congress of Chimney Sweeps in Transylvania, Romania, last August (2018) where 17 European member countries were represented. He said that chimney sweeping organisations throughout Europe, and indeed the world, face similar issues as here in the UK. Lawson supported the fact that being aware of chimney sweeping practices abroad helped inform the Guild’s own training methods and policies many years ago. He recalled a trip he made to a German chimney sweeping organisation in 2007 which ‘opened my eyes’. He also said that Guild members would be offered trips abroad to gain experience of chimney sweeping methods abroad, such as to Germany, in the future. Lawson then spoke about the Carbon Monoxide Protocol (produced by the Guild and a first for the solid fuel industry) and encouraged Guild members to download the guidance, keeping a copy in their van for reference. He said knowing what to do re: CO issues can make a massive difference – maybe to your customer. Then he talked about a new business management certification system being planned for the Guild – ISO 9001. The Guild admin process and procedures need an overhaul to become more efficient and to secure the organisation for the future and the Guild team believe this is the next step. There has been a significant increase in the Guild’s articles and information published on the trade website since August (www.guildofmasterchimneysweeps.co.uk). The aim is to inform members about everything that is happening and increase the prominence of the site. There are 3 sections – News for Sweeps (for members); Do you have a chimney? (for consumers visiting the site) and Industry Latest (for the wider industry) These three news sections have been added since December when Chris Eyte, of Resurrect Media, started giving regular support. The increase of news articles will benefit the Guild, Lawson added. He encouraged members to check these pages from time to time and to link to the articles via the regular email updates. There are also weekly articles posted to the “Advice and Tips” section on the findachimneysweep consumer website. If you are looking for content for your own site and social media then these are for you to use / share with your customers. They also help engage visitors to the site. He said two-thirds of members weren’t on Facebook. Information is exchanged via the Guild Facebook group set up by Andrew Lovick and Lawson said other communication channels were still important such as Sweep Stuff magazine. Every member will be pleased to hear that the Sweep Stuff newsletter will now be printed and posted to members three times per year. A question-and-answer session followed about matters such as the number of appliances on certificates, digital certificates and regional meetings. The AGM 2019 then formally closed with many members turning their focus to the serious business of enjoying themselves at the gala dinner, casino and dance night ahead of them. All the board members later reported that the positive messages following the meeting were unprecedented.